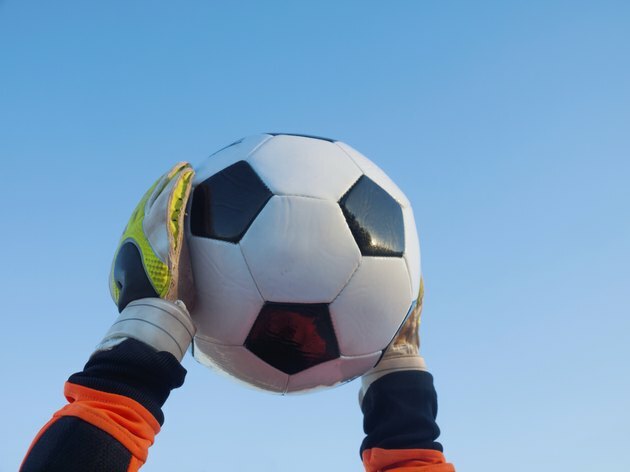 When a soccer goalie stays inside the penalty area, he retains the ability to touch the ball with his hands. Once outside the area, rules against handling the ball apply to a goalie just as they do to a field player. Handling the ball outside of the goal box gives your opponents a direct free kick. Unlike many sports regulations, in which foot positioning matters, the position of the ball dictates whether the goalie can touch it. If the ball is over the line and the goalie is holding it, then the referee may blow her whistle and stop play. Conversely, a goalie who is standing completely outside the box may touch a ball that is inside the goal box area without penalty. Once the referee decides that the goalie has illegally handled the ball outside the box, the whistle blows and play stops. The referee places the ball at the spot of the infraction. When play resumes, the opposing team receives a direct free kick at the goal. A goalie who commits a violation outside the box typically will only risk receiving a card or being sent off the pitch if the handling was clearly committed to prevent an impending goal from going into the net.